Video screening, East Side Freedom Library, St. Paul, Aug 2, 1 PM | Who Built Our Capitol? 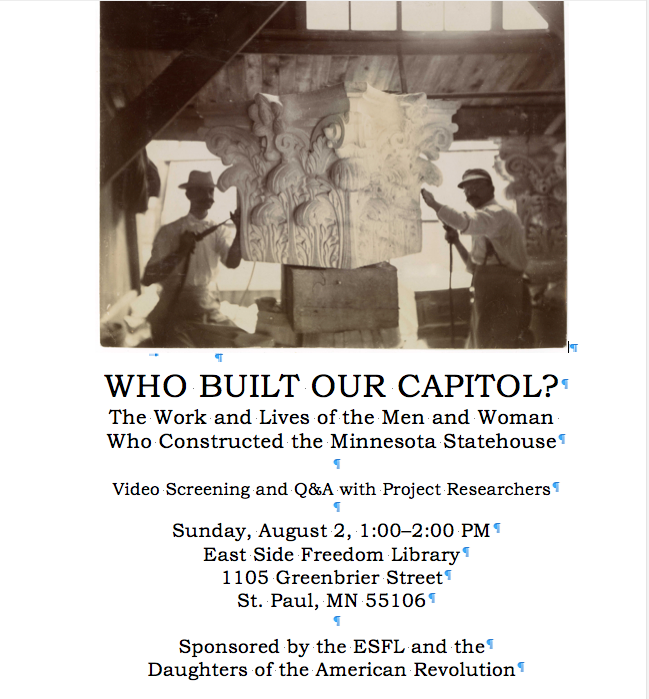 The Daughters of the American Revolution (DAR) and the East Side Freedom Library (ESFL) are hosting a screening of the documentary, Who Built Our Capitol?, about the men and women who constructed the Minnesota statehouse. Randy Croce and John Sielaff, members of the research team, will be present to talk about the project and answer questions. The screening will be on Sunday, August 2 from 1:00 to 2:00 PM at the East Side Freedom Library, 1105 Greenbrier Street (near Maryland and Payne Avenues), St. Paul, MN 55106. The event is free and open to the public.